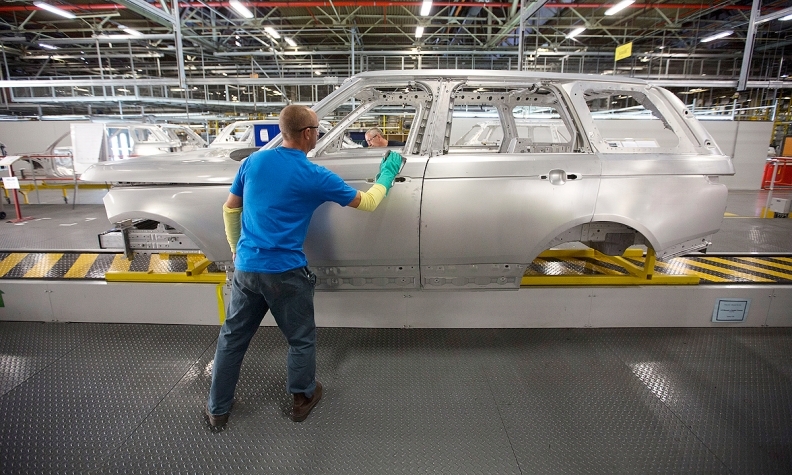 The aluminum body of a Range Rover Sport is inspected at Jaguar Land Rover's plant in Solihull, England. The automaker also uses the material in the construction of its sports cars. CAPE TOWN (Reuters) -- The amount of lightweight, recyclable aluminum in European cars will rise to 180 kg on average by 2020 as automakers look to meet tougher EU CO2 targets, a senior metals industry official said. Global targets to curb greenhouse gases are prompting a shift to aluminum away from other, heavier metals such as steel. Aluminum use is expected to rise to 180 kg per car on average from 140 kg in 2012, with long-term growth coming from rolling sheet and extrusion components, said Gerd Gotz, director general of industry body European Aluminum, citing a new study confirming forecasts it made in 2012. "This will be the growth engine of the aluminum downstream industry," Gotz told Reuters at an aluminum conference in Cape Town. Carmakers, including Mercedes Benz, Audi, Volkswagen and PSA/Peugeot-Citroen are expected to use more aluminum in parts ranging from doors to engines. Heavier, luxury car models are driving the trend in Europe at the moment, Gotz said, although this is expected to filter down to smaller models. "The cars will not land in a landfill anymore and you will be able to re-use the aluminum again and again," he said. The U.S. uses a footprint model that considers a car's size and engine efficiency while in Europe emission profiles are based only on a vehicle's mass. "Mass-based regulations in Europe is not giving the same incentive for light weighting as in the U.S.," Gotz noted. "When you come to a footprint-based regulation you really bring down the CO2 curve in both weight and engine efficiency," he said, adding that the industry body wants the footprint model adopted in Europe.